Watching Greyson and Parker learn to swim the past couple of months has felt like its own little epic journey. The first couple lessons were really quite terrible. Stomach hurting awful. I didn't take any pictures so you'll just have to believe me. Something about crouching behind a slated bench watching your child sob and scream themselves hoarse doesn't really feel like a Kodak moment. At one point Greyson's eyes caught my hiding ones. "Maaaaaaaa!" He calls out to me with white cold fear in his eyes, confused as to why he is hurting and I am not making it better. "MAAAAAA!" A precious term that I rarely hear, and I just sit there, doing nothing. Sometimes nothing is the hardest thing to do, but I know it's exactly what I must to in order for him to grow and to learn. If I want him to learn to swim I can't do it for him and I can't rescue him. If I rescue him he won't grow at all. I will be doing him an incredible disservice and stripping him of all the beauty that hard lessons bring. But his pain is like second hand smoke- it kills me just the same. I just sit there and watch him struggle. And with shaking hands and legs and everything else, he did what was asked of him, over and over again. I knew that things will get easier and better, (or at least I hoped) and that's the thought I repeated over and over in my head. He needs to learn to swim. This will make him safer, stronger, better. He's going to have to suffer first, but it will be worth it. I saw the entire big picture while his view was only of fear and pain. Water floods up his sinus cavities, burning. He couldn't bear water on his face- yet it is covered in droplets that trickle down and assault him. And I sit there and watch his agony. Kinetic and potential energy collides in me, leaving me twitching. My momma heart says- SCREW IT. DON'T MAKE HIM DO THIS. My momma head says- SIT RIGHT THERE- HE NEEDS THIS. But with each lesson came growth. By the second or third lesson I could watch out in the open. And he still struggled, but I could see his strength and hope and he kept trying. And now that a couple of months have gone by, I witness the greatest doggy paddler in the world. 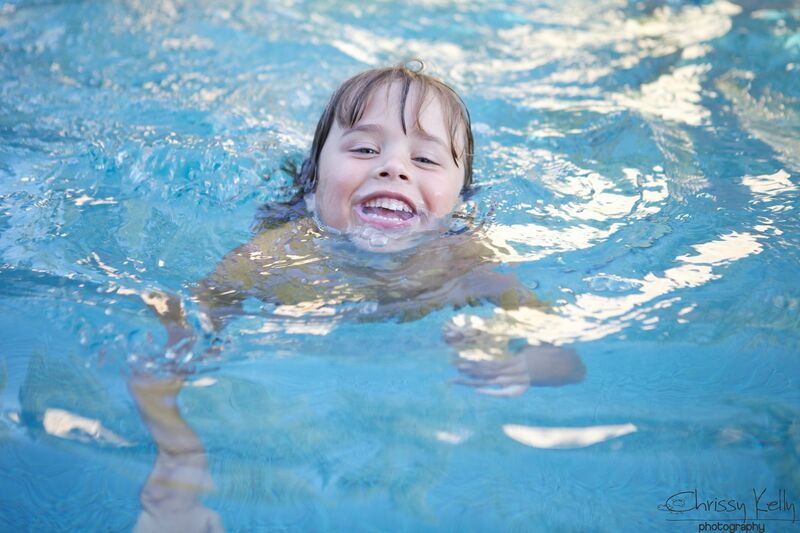 And he loves it so much that most of the time that he is swimming, he is also smiling. 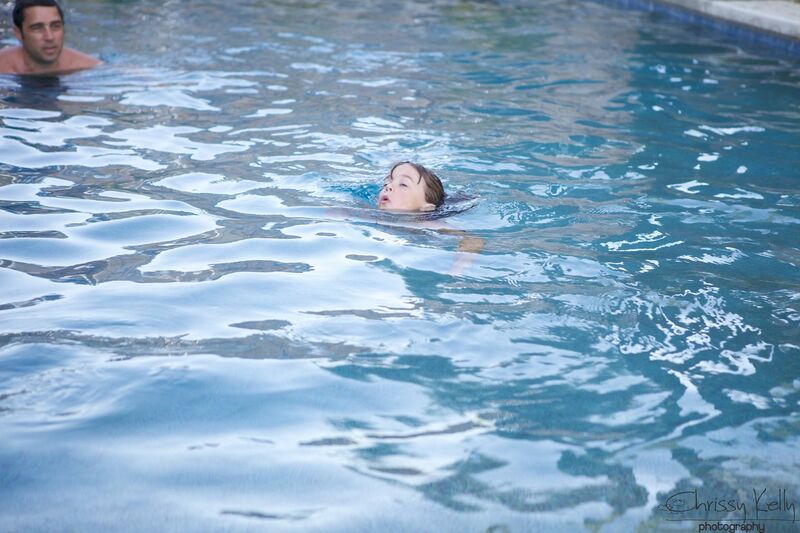 And while watching Grey swim I thought about all the things I prayed and begged for with the boys. Why God? Why autism? Why Greyson? I asked in fear. And then, Please- Oh God, not Parker. Please, don't let it happen to Parker, I said. I didn't feel like God hated them or me. I didn't believe he gave me pain because I could handle it. I just felt like I was all on my own. Like he forgot about me- or maybe he was just too busy to help me or stop the inevitable from happening. I think of the times that were the hardest and I felt the most scared and in pain and alone. I now realize He was there all along. Watching intently, twitching in discomfort- wanting to jump in and stop it or save me, but he knew he couldn't because that would stop me from learning and growing. It would stop me from becoming exactly who I am supposed to be. We really don't learn or grow or change when everything is perfect and easy- do we? Yes, I'm certain God was there all along- and if I would have actually started to drown- he would have jumped in. And looking back- it felt I was dying, but that was me actually getting stronger. God was just teaching me to swim. Maybe you are learning now too. i love the smiles and looks of accomplishment! I haven't gone through any situations like this yet, where I have to just sit back and do nothing, but I cannot imagine the amount of hurt there is in a mothers heart! Beautiful analogy. I too look at my relationship with God as a Father. Being a parent to six kids, I now understand (a little), about watching the struggle rather than jumping in and solving everything. Growth is a process, not a one time event. Love the look on Greyson's face-priceless! THANK YOU for this beautiful post! 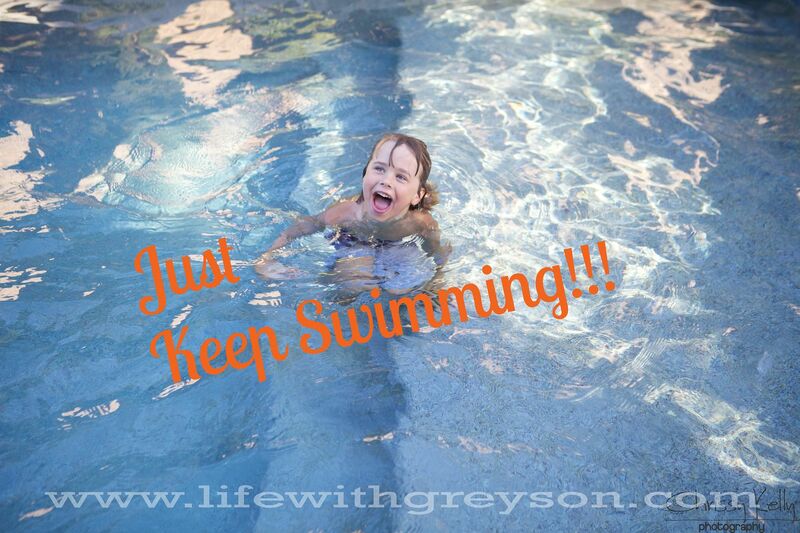 I LOVE the pictures...seeing Greyson swim is so wonderful. And your words to it are so incredible. You are a wonderful writer, your words so often touch my heart. Thank you. This was really beautiful. I have goosebumps! This is the first time I have ever commented but I have read every post and love watching your boys learn and grow. Besides the fact that they are the cutest! Perfect. Thank you. I hope I am learning too! It's hard to feel forgotten by God. I've been there. It's hard doing nothing, gosh it hurts. But I know too that in my hardest, darkest moments God is still with me and I will get up and see the light again. I will be who He is making me to be. Thanks for sharing your heart. Beautifully written and the joy of overcoming on Greys face gives me such hope. I too am a regular lurker. My babies are now young adults. But your analogies about life continue to reflect in our current lives. Our older son struggles with addiction. And learning to step aside as a parent and let him learn life's lessons on his own has been a HUGE struggle for me. 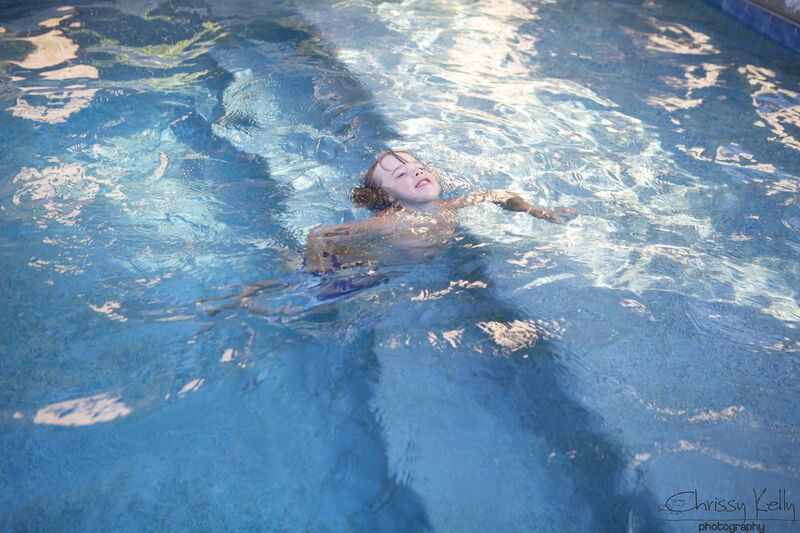 Your struggle as a parent to let Greyson learn to swim, resonated with me. Thanks for sharing your joys and struggles with us. Your words came at a time that I needed to hear them.Thank you! Thank You, Chrissy! My all around, tell it like it is, much needed perspective, feeling it all along with you, favoritest blogspot friend. Yes, sometimes we feel forgotten. My 12 year old son is battling bone cancer. God has wept in the corner watching our whole family learn so many new things. We are stronger, we are learning, but strangely he is also using us to help others too. He is using you, Chrissy, to help many. You have a beautiful gift of writing, you have a wonderful soul that is searching and learning. I think that is what I pray most for our family....that God will continue to help us love Him and learn. That brought tears of happiness to my eyes!! I found your blog today where you were featured on "The Handmade Home." As a retired speech-language pathologist, your story reminds me of many patients I had over the years. I plan to spread the word about your blog. Oh, that other parents of autistic children had the insight, motive and drive that you express! Many lives would be different! Keep helping them to understand and keep encouraging us all! You are in my prayers. Aww, I'm so happy for Greyson! You too. That is awesome. Way to go Greyson!! Chrissy, i just started reading your blog and I am so captivated by your writing. You portray reality in beautiful words and capture the complexity of emotions so precisely. As a mother of 2 boys, I can certainly identify with your post. Thanks for sharing and please continue to inspire us! This, this, THIS! This is like my explanation to my 10 year old about how can God possibly let bad things happen to good people. I explained that we are the children of God, the Father. Sometimes when terrible things happen, God "lets" them happen because He knows better. We can't comprehend the whats and the whys because we are children, but He knows better than we and we have to trust and believe that. And I can so relate specifically to the swimming. I have always had a horrible fear of the water and it was beyond hard for me to watch each of my girls go through those fearful moments, but I was determined, and the payoff was huge. Today they are great swimmers and I am thankful.